The Promised Neverland Vol. 7 Review – AiPT! The children meet a fellow escapee at William Minerva’s underground shelter. 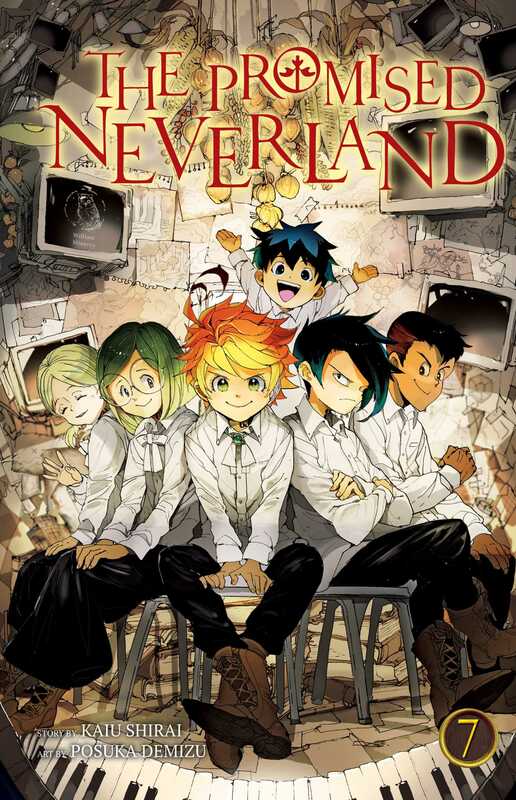 In the landscape of contemporary shonen manga, few titles are more popular than The Promised Neverland. Looking at the series’ consistency over time, there’s little wonder why–it’s excellent. Writer Kaiu Shirai and artist Posuka Demizu have crafted a thrilling mystery full of revelations that leave one hooked even as more and more questions arise. The series’ newest installment, Vol. 7, is a pivotal one. Upon finally reaching the hidden shelter at B06-32, the escaped cattle children meet a Nameless Geezer who’s far from pleased by the prospect of sharing his sanctuary. As tensions rise within the group, Emma, Ray, and the Geezer decide to venture to Godly Pond. Naturally the journey is dangerous, and more of the manga’s lore is revealed along the way. Does this volume live up to the high expectations created by its predecessors? The most significant aspect of this installment plot-wise is the integration of the Nameless Geezer into the main cast. Thankfully, Shirai and Demizu do a fantastic job on this front. The Geezer is a fascinating character with a mysterious past, and his morals are difficult to pin down. He’s clearly suffering trauma as a result of seeing the rest of the children he escaped with die years prior, and in that respect he’s easy to sympathize with. On the other hand, it’s evident that Emma, Ray, and co. cant’ fully trust him, and that he may even be a threat to them. The interplay between the Geezer’s past and current actions make it difficult to describe him solely as a protagonist or an antagonist. Regardless of descriptor, he’s a great addition to the series. This volume also impresses in how it expands the series’ lore. The children find all sorts of information about the world spread throughout the underground shelter, to include maps of nearby areas. This geographical information includes the series’ first direct reference to Goldy Pond, which fans who stay up to date via Weekly Shonen Jump will recognize the significance of. The Geezer’s accounts of his past allude to various unknown threats that generate a lot of tension and dread. The protagonists have a lot more to fear besides just Isabella and the rest of their former caretakers. Demizu’s artwork is also wonderful as always. The characters all have fantastic facial expressions and body language. This allows the reader to get a great sense of how the protagonists cope with their traumatic circumstances, not just in moments of sadness but also in moments of joy. There’s an unexpectedly large amount of comedy in this volume, and much of its success stems from Demizu’s skilled character work. The page compositions are also strong, with a chaotic variety of layouts reflecting the plot’s frantic hustle and bustle. The flow of actions across panels is also smooth for the most part. There’s only one brief scene toward the volume’s end that I have qualms with. It occurs during Ray, Emma, and the Geezer’s trip through the demon-infested woods toward Goldy Pond. They’re walking cautiously until a gigantic wild demon leaps out from above them and makes a loud landing. It’s a good scene as a whole, but it’s harder to follow than the rest of the volume. The choices in which actions are drawn out versus not leaves a bit to be desired, as critical movements become somewhat clunky and confusing. The demon’s landing is particularly disappointing, as the composition and perspective of it don’t effectively convey its sheer mass and power. These things can easily be inferred, but they’re not actually conveyed effectively on the page. As a whole, The Promised Neverland Vol. 7 is a nearly perfect book. Shirai and Demizu deliver fantastic character work, world-building, visuals, and even some unexpected comedy. The only flaws with this volume concern a brief scene towards the end, and they’re minor enough to feel like nitpicks. This series continues to be one of the best comics currently being published, and I can’t recommend it highly enough. From its character work to its world-building, this is a nearly flawless volume.